My Health Record moving to an opt-out model is the most important digital health change for consumers in Australia in 2018. We see My Health Record as a key step in the shift from health consumers as passive patients, to consumers as active partners in our own care. Every Australian with a Medicare or Department of Veteran’s Affairs number will have a My Health Record created for them in 2018, unless they choose to opt-out of having one created. All Australians should consider the benefits and risks of My Health Record in the context of their own lives before making their decision. 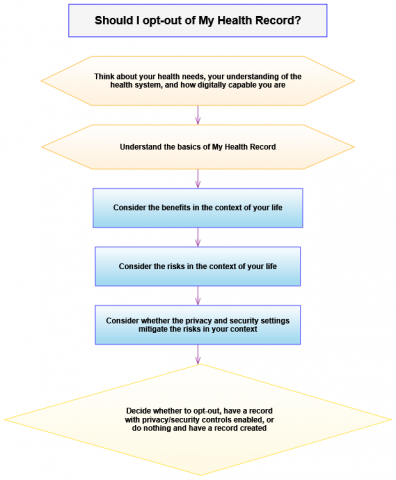 To help consumers make an informed and considered decision about whether or not to opt-out of having a record created for them, we are holding a series of 6 webinars starting in mid-August that cover the key information people need to understand the benefits and risks of My Health Record in the context of their own lives. The webinars will include knowledgeable panellists and provide a chance for consumer questions to be asked of them. Summaries and other 'bite-size' content based on the information covered will also be released after the webinars. Each webinar will focus on a different area of important information or decision that a person has to make in order to arrive at an informed decision. Those steps are summarised in the flowchart below. 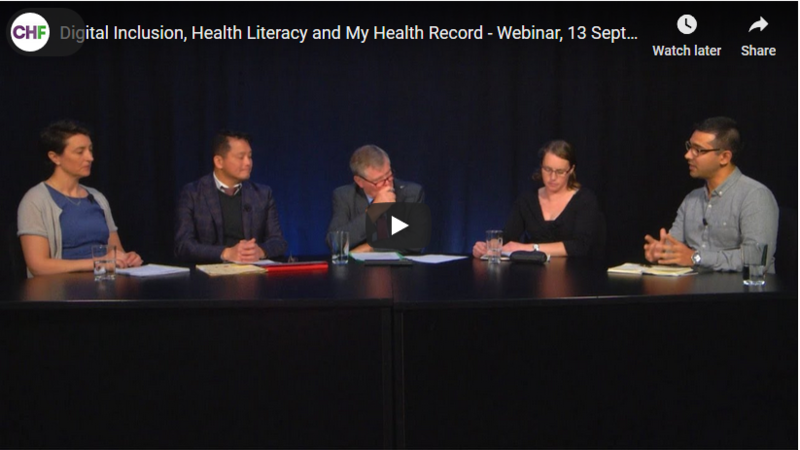 A central hub for everything to do with the webinar series is available here: https://chf.org.au/hub-my-health-record-webinar-series. We are collecting key information on the webinars, how you can ask questions before the webinar, register for each of the webinars, and find the outputs created after the webinars in this section of our website. 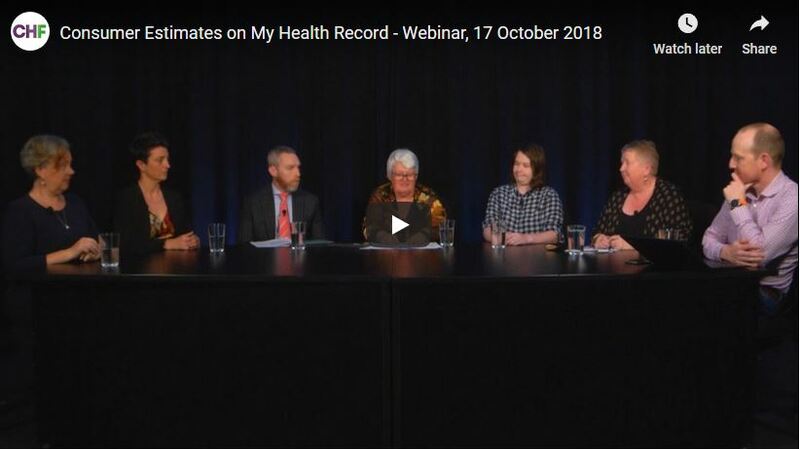 Use the links at the bottom or to the right of this section to navigate through each part, or head to the My Health Record Webinar Series Hub to get started. Before deciding whether any digital tool for helping you manage your health is right for you, it is helpful to have a think about your health needs, how you currently manage them, and how confident you are in learning how to use new digital tools. What health issues do I have? How do I manage my health? How confident am I with digital tools? Many of us are living with one or more health conditions that impact on our lives. Many more of us know that we are at risk of developing other health conditions, because of family history, lifestyle or environmental factors. The more health conditions you manage, the more benefit you might get from a digital tool that helps you keep track of test results, prescriptions and trips to the doctor. It is important to consider as well that you can't always know what health issues are around the corner, or when you might need emergency care. Consider how you organise the management of your health conditions. Many people keep physical files of their health records, store them in the cloud or on a USB, while others rely on their health care professionals to store them. If you have found it a challenge in the past to quickly summarise your health situation to someone new, or had to spend much time chasing up results or waiting for them to move from one health clinic to another, then a digital system that contains summaries of your health or improves how your health information moves from place to place may be useful to you. Managing the privacy and security settings of the digital tools you use is important to make sure you're protected, and knowing how you can use a tool increases how well it works for you. For example, more and more health and wellness apps are available for smartphones, but they are not well regulated, meaning you have to exercise judgment. Think too about how you can get help with digital tools. You can learn more about managing digital tools through programs like Be Connected, asking at your local library, or discussing it with family and friends. 5:51 - Dr Chris Pearce, perhaps you can talk about, from the clinical point of view, how important is the sort of connection of information that Russell was just describing, having it in one place? 7:01 - And Chris Freedman, from the pharmacists' point of view, in general terms, what would you see as the benefits? 8:30 - I'm sure you often hear, "Well, I had a test done at the hospital some time ago," or some other place, "Don't you already have that information?". People are so used to info being available, how do you explain the challenge in health? 11:03 - Russell, you're an early adopter and early user of the MHR, have you seen much in the way of advances in what it's able to offer since you signed on? 12:52 - Chris Pearce, we've got the perspective of somebody with a chronic condition. What are the benefits for, I guess, the majority of the people who don't have a chronic condition? 13:55 - What about healthy young adults? 14:40 - What are the sort of things that MHR can help with pharmacists in terms of their patients or the customers? 18:31 - Chris Pearce, do you think doctors as a rule are seeing all the benefits? 20:33 - How much do you think the My Health Record will change healthcare, say, in five to ten years? Do you have a sense that, are we on the edge of a revolution or is it going to be a sort of a more incremental type of process? 22:58 - Do you see this in the so-called meta data that's going to become available as a big long-term potential benefit to the way population health can be improved? 28:22 - Is one of the benefits going to be to bring the various health professions closer together because they're relying on the same sort of database, which all can see at the same time. Is this likely? 31:30 - Amandeep,you may not have been directly involved but I wondered if you've got any perspectives on the likely outcomes of ADHA benefits measurement projects? 34:53 - Chris Pearce, how do you see, say, in five years time, the relationship, say, of the general practitioner and the patient being changed? Will the GPs be spending more or less time with patients? Will the GP be able to reach a course of treatment quicker? 36:28 - Russell, do you think you've got more control of your healthcare? 38:28 - Is there an argument for the notes or the records that will be available under the My Health Record for some sort of note as to why a test or investigation was not ordered, do you think, Amandeep? 40:48 - Do you think the MHR is going to promote or stifle innovation? You mentioned apps before. Do you think we're likely to see more of these being made more used or accessible as a result of MHR? 45:22 - Would you say that having more information, say a better insight on say knee surgery, that the doctor can immediately present to the patient, would that make a difference in terms of outcomes? 46:08 - Do you think that public at large has been given enough information about the benefits to them of better, sharper information about their healthcare that's available through MHR? 50:00 - Chris you have said before that one of the major challenges is the lack of a clear structure devoted to clinical safety. Do you think that's changed recently? Is the MHR going to help this? 51:00 - Chris Freeman, the importance of accuracy of course is vital with medication. Do you see the MHR having a very significant impact in terms of dispensing of correct drugs, that sort of thing? 52:35 - Russell, do you think the average consumer is aware of the benefits of MHR? 53:36 - Do you think the medical professional profession is sufficiently well informed on the MHR? 55:00 - Is there a need for more incentives for the professional to get on board? Do you think that the technological change is pushing us inevitably towards a different sort of health funding system? The person who asked the question is named in brackets. 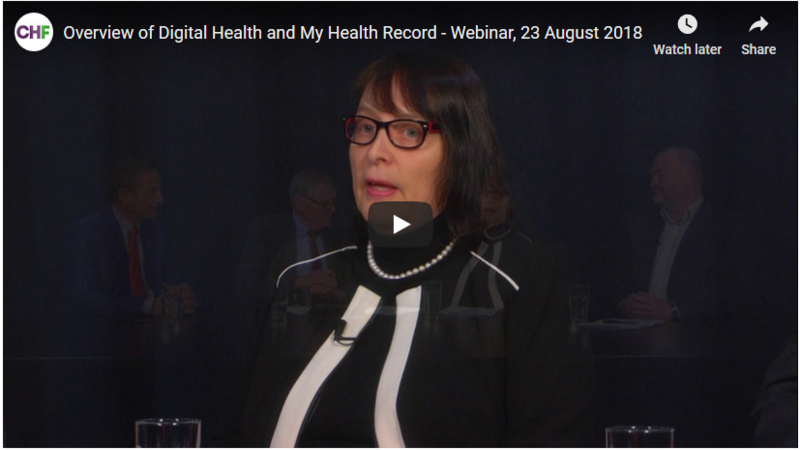 3:08 - (Jo) We might start off by asking each of the consumers can you take a couple of minutes to tell us what your current attitude towards My Health Record? 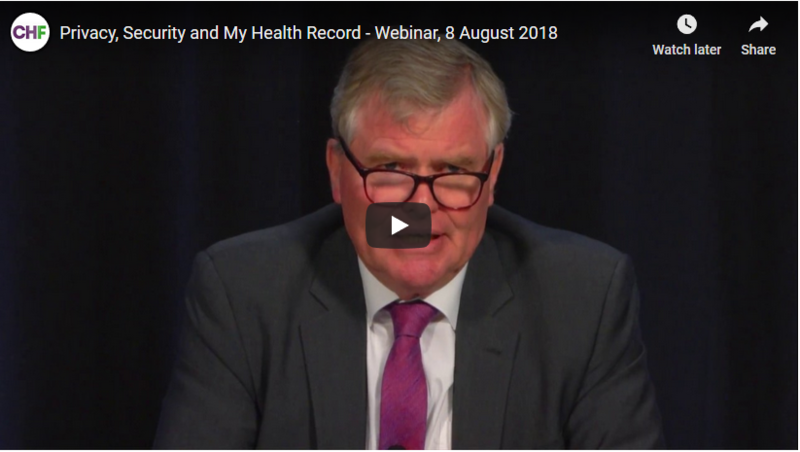 10:03 – (Jo) Government reps, did you want to respond at all to anything that's said or can you outline what the role of the agency is in My Health Record? 14:55 - (Jo) What would you say to people who are saying that a lot of the marketing, a lot of the emphasis has been on health professionals rather than the consumers who it's supposed to help? 18:15 – (Marc) Is MHR data being used to do more to move healthcare into basically preventative healthcare? 20:25 – (Sharon) How do we ensure that an e-conversation doesn’t just happen between medicos, leaving the consumer out? 22:43 – (Marc) What level of security do we have as consumers the data has been taken care of, and if that does get out in some way, what can we do? 27:14 – (Marc) Can the SMS notifications about access go to the designated carer? 28:06 – (Paige) Why send that text message after someone accessed the record and not before? 31:00 – (Paige) There's no, as I'm aware, incentive for GPs, medical practitioners, to take extensive notes, and that the system relies on that. How are we going to make sure that people are taking notes in a way that is clear, that allows for nuance, and when someone else looks at that record they can say, "Actually, I know what was happening here"? 34:17 – (Marc) Does the GP see it as an admin layer, or an actual benefit? 35:50 – (Sharon) Until 12 months ago, we had five GP practices in five towns. There was two IT systems, that didn't talk to one another. 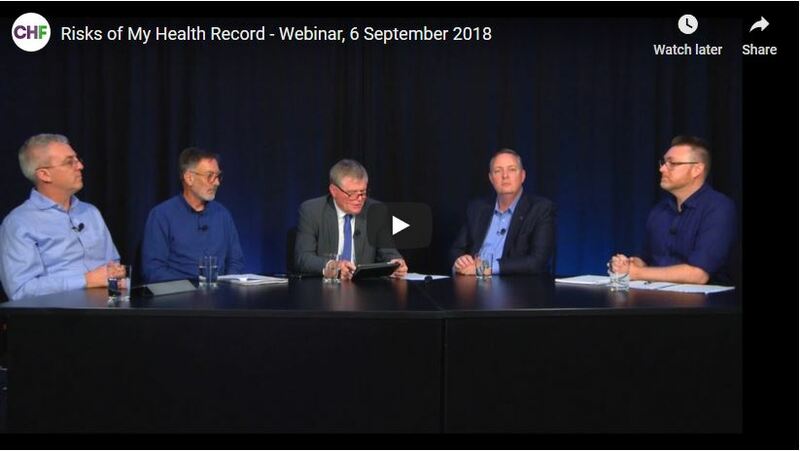 We're holding our breath, "Will they talk to My Health Record?" 37:10 – (Marc) Why not just use a digital wallet to hold the record, or a token, or something of that nature? 41:38 – (Jo) That was one of the questions that came through to us online. "How will people access their health record, if they're unable to access through myGov?" 44:23 -(Jo) On secondary use of data, Michael, can you tell us about who can access data and for what purposes? 47:46 – (Jo) So what checks and balances are there? Somebody says how they’re going to use the use the de-identified data. Then they use it for a different purpose. What happens then? 48:32 – (Jo) What's the process for de-identifying data? 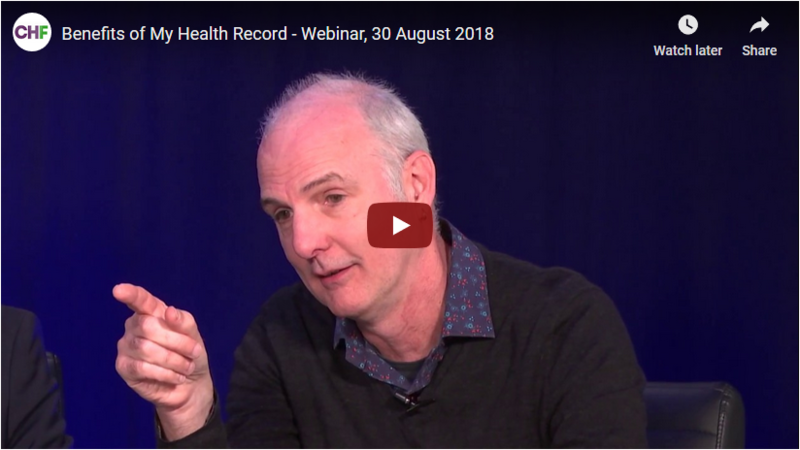 50:09 – (Marc) Is it too simplistic to say if you are receiving the public benefit of a medical service, then you should, by rights, because you're in the health system, be willing to basically give them your de-identified data, anyway? 55:49 – (Paige) I think it's pretty flippant the way we're talking about, "Oh, people haven't been educated about it," or whatever. It's not an abstract thought, when we think about this data going to people. It does happen; it has happened. 1:00:49 – (Sharon) I was wondering how we're going to protect the concept of informed consent? 1:04:23 – (Sharon) How are we going to teach the population how to use it? 1:08:40 – (Paige) What kind of assurances are there for the privacy of young teenagers, and what happens when someone turns 18? 1:14:00 – (Paige) Are there instances where people will have to have a record to access certain kinds of health care or trials? 1:16:38 - (Jo) A question from Rosemary; "My GP's not currently set up for MHR, and he's reluctant to get involved, what rights do I have as a consumer? How can I insist?" 1:18:30 – (Jo) What are you doing with specialists to get them on board?